The XCertina Bag quick-pack bag is the quickest and best way to pack and store your wing. The way you pack and store your paraglider directly affects its longevity and performance – careless packing can crease and damage the internal reinforcements in the wing. Whether mylar, nylon or anything else, these elements are crucial in forming the clean leading-edge profile that your glider needs to retain maximum performance. Concertina-folding your wing is the surest way to protect the integrity of your leading edge, but this can be an awkward and time-consuming task that is difficult on your own and almost impossible in a strong wind. 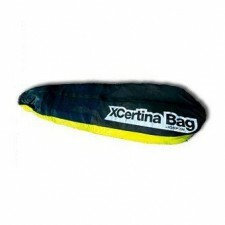 The XCertina Bag is the quick and easy solution to the problem. It’s quicker than the conventional packing system and helps retain the performance of your wing over time. It’s the easiest way to pack up in a strong wind, and better still it’s the simplest and quickest way to unpack and get ready to fly. The XCertina Bag has been updated, taking into account new technology in wing design and feedback from pilots. 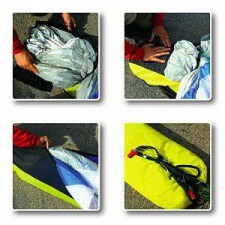 A longer mesh and velcro sleeve now holds the leading edge together to give a snugger and more secure packing system. The upper surface is also entirely made of mesh to allow the wing to breathe more easily. There is a special pocket to stow your risers to keep the whole package neat and tidy. There is also a two-way zip so the choice of which way to close the bag is yours. There is now a compression strap attached to the bag to keep everything together.